Across America We the People are rising up in a Rolling Rebellion for Real Democracy. Join us! From corporations claiming unalienable rights as “corporate persons” to billionaires manipulating elections with their wealth – our federal democracy is corrupt to the core. Every issue that we care about stems from this systemic corruption. It is time to tap into the United States’ revolutionary roots and in the spirit of the Declaration of Independence instigate a second American Revolution against oligarchic rule. Rolling Rebellion for Real Democracy is a collaboration between many organizations, working together to facilitate a series of non-violent, artfully rebellious events around the country. Using creative, high visibility actions, we hi-light the emergent US Democracy Movement, and spur on its escalating fight for real democracy; to fight corruption and bring power back to the people. Each rotation of the Rolling Rebellion will take on a new issue characterizing this corruption. 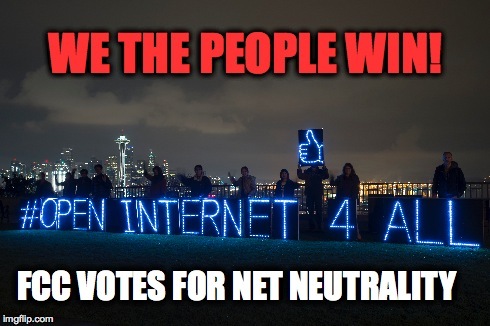 In March, 2015 – we are focusing on stopping Congress from passing “Fast Track” legislation that would allow the anti-democratic TPP (Trans-Pacific Partnership) to be signed into law, functionally undermining democracy, human rights, and environmental protections & to safeguard the internet from as a tool for democracy through Net Neutrality. Everywhere! Check our action map to join a Rolling Rebellion action near you, or sign up to host your own. Don’t forget to report back on your actions when you are done.